in gratitude for all the ways God speaks to us. Augustine: Sermon on Matthew 11:2. "Christ's Answer to John the Baptist," Martin Luther, c. 1522. "In the new state of the Church where the true glory of God shines: the people are not compared together, but the types of doctrines, the preaching of John with the law and the prophets: and again, the most clear preaching of the gospel is compared with John's." "Where there is true faith, yet there may be a mixture of unbelief. The remaining unbelief of good men may sometimes, in an hour of temptation; call in question the most important truths." "...the least true Christian believer has a more perfect knowledge of Jesus Christ, of his redemption and kingdom, than John the Baptist had, who died before the full manifestation of the Gospel." "Preaching for the Poor; Matthew 11:5," Charles H. Spurgeon, 1857. "The course of Jesus was so different from what John himself, in common with other Jews, expected of the Messiah, that after lying in a dungeon for a year, he began to be uncertain. If Jesus was the Christ, why did he not proclaim himself the Messiah King, destroy the power of the Romans and of Herod, and release John himself from prison? So he reasoned." Commentary, Matthew 11:2-11, Advent 3A, Arland J. Hurtgren, Preaching This Week, WorkingPreacher.org, 2016. "The question of John the Baptist to Jesus is one of the most important questions of Advent and of Christian theology more broadly." ""Are you the one who is to come, or are we to wait for another?" If that isn't a question that breaks your heart ... or maybe, it speaks a truth, many truths, that so often ..."
"The Politics of Identifying Jesus and John the Baptist," Richard Davis, Political Theology Today, 2016. "I wonder what version of Jesus would emerge for me now if I took this invitation to heart. I wonder where and how God would appear if I were more attentive to the stories that usually lie beneath my notice. I wonder how much divine richness I've squandered by mistaking certainty for faith." "A God of Surprises," Commented Bible Passages from Taize, 2010. Commentary, Matthew 11:2-11, Advent 3A,Arland J. Hurtgren, Preaching This Week, WorkingPreacher.org, 2013. "As his disciples, and with mutual support, we align ourselves with his ministry in our witness to the gospel and in our works of mercy and our care for the world." "Disappointed with God at Christmastime," David Lose, Dear Working Preacher, 2013. "And so while Matthew's portrayal of John and his doubts is striking, and even startling, maybe it's not so odd to hear about it at Christmas, when we, too, at times, feel stuck between God's promises made and God's promises kept; when we, too, at times, know ourselves to live in between Christ's first coming at Bethlehem and his second in glory; when we, too, at times, disappointed by ourselves, the world, and even God, find ourselves whispering a prayer as desperate as it is ancient and simple: O Come, Lord Jesus, come." "Forerunners," Nancy Rockwell, The Bite in the Apple, 2013. "Mandela included his jailers in his presidential inauguration. President Clinton asked him, Didn't you hate them?, Mandela said, Yes, but I realized if I hated them I was still their prisoner, and I wanted to be free." "Jesus used to be offensive--what changed?" Russell Rathbun, Question the Text, 2013. "Maybe looking at the incarnation in its infant state is just so much more palatable then where it ends up." "Have you ever found yourself asking John's difficult, important question? Where did you hear or see your answer?" "John the Baptist," sermon discussion from Frederick Buechner, Frederick Buechner Blog. "John the Baptist didn't fool around. He lived in the wilderness around the Dead Sea. He subsisted on a starvation diet, and so did his disciples. He wore clothes that even the rummage-sale people wouldn't have handled. When he preached, it was fire and brimstone every time." "Jesus Draws a Line in the Sand," Andrew Prior, 2013. Comentario del San Mateo 11:2-11 por Pablo R. Andinach, Working Preacher, 2013. Commentary, Matthew 11:2-11, Advent 3A, Ben Witherington, Preaching This Week, WorkingPreacher.org, 2010. "The undercurrent of the entire text is the difference between people's expectations, even John's, and the reality of who Jesus was and the actual character of his ministry." Commentary, Matthew 11:2-11, James Boyce, Preaching This Week, WorkingPreacher.org, 2007. Matthew 11:2-11: Comments (commentary) and Clippings (technical notes for in-depth study), Advent 3A, Chris Haslam, Diocese of Montreal. "Are you the one...?" Pilgrim Preaching, Keeping company with biblical texts and the people who hear and preach them, a weblog for preaching, by Mary Hinkle, Luther Seminary. "I get how John got Jesus wrong?or at least how he would come to need the clarification he seeks. But how are we getting Jesus wrong? The harder sermon to write is one that investigates how Jesus does not match up point-for-point with my and my hearers' expectations." "First Thoughts on Year A Gospel Passages in the Lectionary: Advent 3," William Loader, Murdoch University, Uniting Church in Australia. "...tell John about change and transformation in people?s lives. That is what we are here for and that is what excites us. Spiritualities excited by anything else (like the magic of miracles, like overcoming the enemies of God by judgement, like getting all the rules right) miss the point." "For Israelites (or Christians, for that matter) who assume a privileged position with God, that assumption could be their downfall as it can lead to the conclusion, "We don't need to repent" or "We have nothing to repent of." They are condemned by their words (or lack of words)." "Do You See What I See?" David Lose, Dear Working Preacher, 2010. "Every once in a while, the appointed passage speaks so clearly to our own day and time that it's nothing short of arresting. This is one of those weeks." "Jesus has not taken an ax to any trees, and has not burned any 'chaff' with 'unquenchable fire.' He has not led a revolt, nor caused any prison walls to fall." Holy Textures, Understanding the Bible in its own time and in ours, Matthew 11:2-11, David Ewart, 2010. "Jesus honourably does NOT answer the question directly. Instead, he tells the followers of John to go back and report what they themselves have seen and heard. In other words, make up your own mind; you decide who I am." "The Fear of (Spiritual) Blindness," Alyce McKenzie, Patheos, 2010. "In the season of Advent, when many are carrying heaven burdens of sorrow, guilt, regret, and frantic busyness, Jesus offers to clear our spiritual lenses. Then we will be able to see in the mirror both our own need for repentance and God's offer of forgiveness, grace, and rest." "John the Baptist Is the Anti Christ," Russell Rathbun, The Hardest Question, 2010. "I always wondered why John was not one of Jesus’ disciples. He seems like he would be the number one candidate...."
Evangelio, San Mateo 11:2-11, Osvaldo Vena, Preaching This Week, WorkingPreacher.org, 2010. "Third Sunday in Advent; Matthew 11:2-11," The Matthean Advent Gospels, James Arne Nestingen, Word & World: Theology for Christian Ministry, Luther Northwestern Theological School, 1992. "In Christ, God has decided that things are not going to go on like this, the rich taking it out of the backs of the poor, the strong relying on the disadvantage of the weak or impaired to perpetuate their illusions of superiority. The new age has already begun in the One who is to come, the One who has already arrived and will yet come." "Matthew in Minneapolis and in Israel," Sarah Henrich, Word & World, 1999. "Let Actions Speak," Advent 3A, Fr. Gerry Pierse, C.Ss.R., from Sundays Into Silence: Reflections on the Sunday Gospels in the Light of Christian Meditation. Claretian Publications. "When we meditate, we just BE in God's kingdom which is within us, and this leads us to act in a way that is creative of his kingdom around us. Is there any better way to bring Christ into the world as we prepare for Christmas?" "The One to Come Is Here!" Rev. Bryan Findlayson, Lectionary Bible Studies and Sermons, Pumpkin Cottage Ministry Resources. Includes detailed textual notes. Wellspring of the Gospel, Advent 3A, Catherine McElhinney and Kathryn Turner, Weekly Wellsprings. "Have you heard or seen a prophet for our times?" "What Do We Expect From God?" Larry Broding's Word-Sunday.Com: A Catholic Resource for This Sunday's Gospel. Adult Study, Children's Story, Family Activity, Support Materials. "Have you caught the 'holiday spirit' yet? How do you get into the holiday mood? Do you rely on others or events to spark your 'Christmas feeling?'" "The good news, therefore, cannot be lepers cured to suffer reinfection later, nor can it be tied to the religious monstrosity of corpses raised for a few more years here only to die again. The continuing ministry of the kingdom, to which the healing ministries of Jesus and the apostles attest, bestows the greater blessing of cleansing from sin (as seen in healing lepers) and eternal life (as seen in the raising of the dead). All of the others in Isaiah's and Jesus' lists-the blind, the lame, the deaf, the poor-must be interpreted in this way." "The Signs of the Messiah: Parallels Between A New Dead Sea Scroll Fragment (4Q521) and the Early New Testament Gospel Tradition," at James Tabor's The Jewish Roman World of Jesus. "John the Baptist, of the Aaronic priesthood, was revered as a returned "Elijah," a sure sign that the End was near." Alison, James, "Stretched Hearts," The Christian Century, 2007. Baxter, Wayne, "Healing and the 'Son of David': Matthew's Warrant," Novum Testamentum, 2006. Boerman, Daniel, "The Chiastic Structure of Matthew 11-12," Calvin Theological Journal, 2005. Enniss, P.C., "Waiting," Journal for Preachers, 2005. Sermon. Haemig, Mary Jane, "Advent Preaching on 'Doubting John'," Lutheran Quarterly, 2006. Henrich, Sarah, "Matthew in Minneapolis and in Israel," Word & World, 1999. Niedner, Frederick, "Cellmates," The Christian Century, 2004. Sawicki, Marianne, "How to Teach Christ's Disciples: John 1:19-37 and Matthew 11:2-15," Lexington Theological Quarterly, 1986. Talbert, Charles H., "Matthew 11:2-24," Interpretation, 2010. Viviano, Benedict, O.P., "The Least in the Kingdom: Matthew 11:11, Its Parallel in Luke 7:28 (Q), and Daniel 4:14," The Catholic Biblical Quarterly, 2000. "A Parable: The City and the Wilderness," Sermons from Seattle, Pastor Edward F. Markquart, Grace Lutheran Church, Seattle, Washington. "The Place He Stops Is Now," the Rt. Rev. Porter Taylor, Day 1, 2004. "A Parable: The City and the Wilderness," Advent 3A, Rev. Edward F. Markquart, Sermons from Seattle. "Storypath Lectionary Links: Connecting Children's Literature with our Faith Story," December 15, 2013, Union Presbyterian Seminary. Connections: Mattthew 11:2-11 and The Bravest Dog Ever: The True Story of Balto by Natalie Standlford. 2010. "The Gos-pill of Jesus Christ," Charles Kirkpatrick, Sermons4kids.com. "Even from Prison, John the Baptist Prepares the Way for Jesus," Sunday School Lessons: Family Bible Study, art projects, music, stories, etc. Free Public Domain Clipart for Church Bulletins: John the Baptist, Church Bulletin Resources. Clip Art, Matthew 11:10, Fr. Richard Lonsdale, Resources for Catholic Educators. 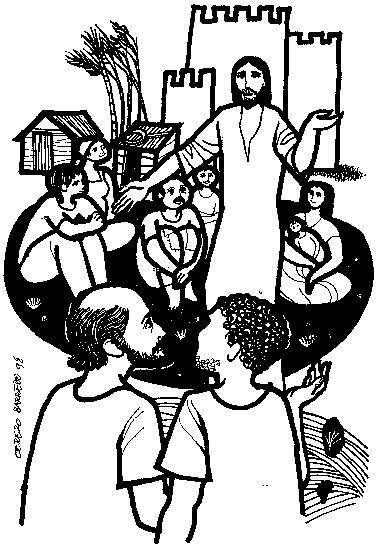 Matthew 11:2-11, at Cerezo Barredo's weekly gospel illustration. Liberation emphasis. Lord, What A Parade! Text: Carolyn Winfrey Gillette, Tune: LYONS 10.10.11.11 (“O Worship the King, All Glorious Above!”) A new hymn based on Matthew 21:1-11; Mark 11:1-11; Luke 19:28-40; John 12:12-19 that was written for The Presbyterian Outlook magazine for Lent 2011 and available with the music. Are You the One Who is to Come? Carolyn Winfrey Gillette, Tune: ST. LOUIS 8.6.8.6.7.6.8.6 (?O Little Town of Bethlehem? ), The Presbyterian Outlook magazine.